A Dimensional Education was a campaign that began with the College's signature application that emphasized Bennington's signature rigor: to work in a world without givens, to curate an education to answer the more probing questions; to be reviewed by revered faculty and alumni across disciplines. 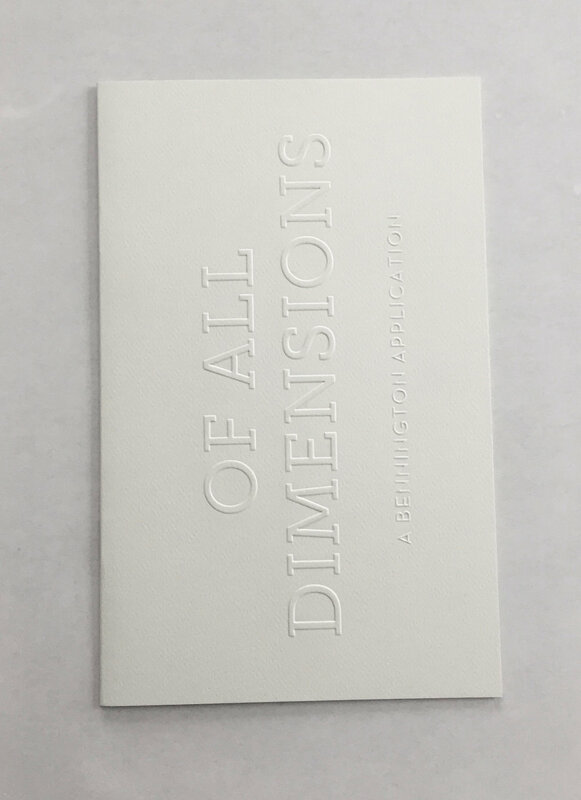 The application was a booklet covered in white, blind embossed lettering. Supporting visual metaphors we developed fair table cubes that called out the colleges attributes, as told by external reviews. The cubes were created to respond to a call for fair table imagery that could travel easily and show campus. They fold flat, stack, turn for alternate viewing. As part of the team that developed Bennington's groundbreaking Dimensional Application, our challenge was to develop an application that would be a sincere invitation into the process of a Bennington education. We needed to articulate it in a form that would be as telling and interesting as the application itself. We developed a box to mail to guidance counselors in sending schools.